Termini Imerese kylpyläkaupunki runsaasti taidetta ja luonnon kauneutta, sen alkuperä on menetetty aikaa. Sen alueella on edelleen Kreikan kaupunki Himeran Temple voiton ja suurin hautausmaa. Niistä taideteokset lisäksi katedraali voit ihailla Shrine of Our Lady Lohdutus kanssa sisällä kuuluisa stukki Serpotta, roomalainen vesijohto (Cornelio) ensimmäisellä vuosisadalla jKr. C., roomalainen amfiteatteri, kylpylä (liittyy legenda Hercules) ja monet muut monumentteja vierailun arvoinen myös museo ja Antiquarium Himeran. Tämä alue on asetettu upea Villa neuvosto (hiljattain remontoitu), joka alkoi asuin asunnon, kalustettu raittiutta, tyylikkyys ja hyvä yksityiskohtia. Neuvoston House on paikka soveltuu kaikenlaisiin asiakas, myös pariskunnille ja perheille ja sitä ympäröi vuosisatoja vanhojen oliivipuiden ja suuri niityt, joissa on upea ja suuri uima-allas. Laajat terassit Belvedere Villa neuvoston tarjoavat mahdollisuuden nauttia taivaallinen näkymän -spettacolare- ja ainutlaatuiset näkymät valtava kuilu-termitano joka antaa tunne upotettuna kristallinkirkas Välimerellä ja toisella puolella asteikon yläosassa viehättävä Monte San Calogero. Villa Hallitus on hyvä asema strategisena vierailulla lähistöllä Palermo (Sisilian pääkaupunki), jonka polku arabi-Norman julistettiin UNESCO "World Heritage", ruokinta se aivan Unescon maailmanperintölistalle sen yksinomainen laji, joka sisältää lisäksi Palermo (keskellä rehevä "Conca d'Oro") myös Cefalu (tärkeä matkailukeskus hyvin varustettu) ja Monreale (sen katedraali koru taiteellisen ja arkkitehtonisen Norman); polku on ominaista unionin kahden vastakkaisen maailman: arabi-muslimi ja Norman-katolinen. Tästä kaunis ja ainutlaatuinen maisemia idea laittaa Villa hallituksen käytettävissä matkailijoille, jotka haluavat viettää loma, ehdottomasti ikimuistoinen, keskellä kipinä meren ympäröimänä kukkulat ja helmiä koko taide- ja kulttuuriperinnön ainutlaatuinen maailmassa . Lisäksi voit nauttia sisilialaista ruokaa, joka alue- ruokia Italiassa on enemmän sidottu historiaan ja kulttuuriin alueellaan, että omistajat (lisävaruste) huolehtii ruoanlaitto herkullisia ruokia ja rikas makuja Välimeren, joka on vihjeitä ja muistoja kreikkalaisesta keittiöstä mutta myös mausteinen makuja upea ja herkullista sisilialaista ruokaa. The most amazing place on earth! The beautiful photos of this Villa do not do it justice. It was simply breataking in every way! It was perfect for our family of 7. We will be speaking about it for years to come. Pietro and Rosella were wonderful hosts very responsive and helpful. The Sicilian feast Rosella prepared was second to none, each course was presented by the lovely Julia as she explained all 7 courses Not to be missed if you stay here. 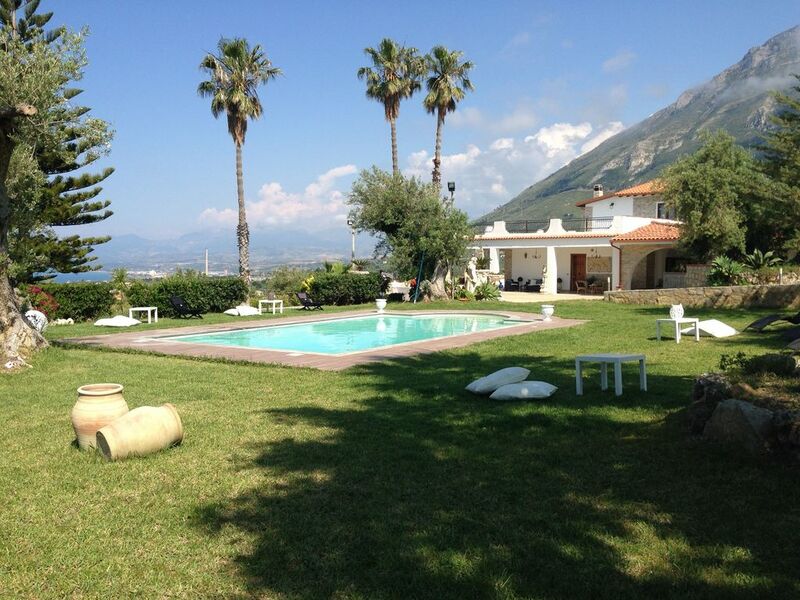 The views, the amenities and the proximity to our points of interest (Selinunte, Cacammobamd Palermo) were fabulous. Grazie Pietro and Rosella well done. Thank you to Carlo and Julia. Our stay was to short. Grazie è stato un vero piacere accogliere una fantastica famiglia come la tua. Un caloroso abbraccio a tutti voi. Upon our arrival in Termini Imerese we were met at the cathedral by Pietro and his wife Rosella. We followed them to their home through the winding streets and came upon an oasis of calm. Each morning we would awake to a rising sun over the sea , followed by a dip in the pool. Breakfast was enjoyed on the veranda . Grounds are beautifully decorated with replicas of Roman sculptures. The facilities are very good and are set up for large parties. Access to the autrostrada is only 10 minutes away, once you learn the way. As a tourist this was a challenge we learned quickly with Rosetta's help. The bedrooms are on two levels and worked well for our party of 4 . The kitchen is well equipped , although we did not cook other than breakfast. Food shopping was nearby and we stocked up on basics like coffee and munchies. Creating an everlasting memory of our stay was the Sicilian feast prepared by Rosella with support by Julia. Not only did we enjoy the most fabulous food but we engaged in great conversation and were able to learn more about our hosts. This is an additional cost, but well worth the experience. We were also able to travel to Cefalu, Palermo and Argegento on day trips . This was in addition to fully enjoying a very leasurly time at Villa Consiglio. Vi siete mai chiesti che cosa sarebbe come scoprire la famiglia da altra parte del mondo? E "INCREDIBILE"!!! Ci sono i pasti della famiglia, danzante e famiglia e autoscatti, e pasti in famiglia, e piccole principesse, ben si ottiene l'immagine un sacco di pasti in famiglia!!! Ancora più importante se sei nato in una famiglia siciliano come il mio veramente beati voi! Questa casa e stata la scena più incredibile per un qualcosa di 50 donna per scoprire la famiglia mai incontrato prima. La casa era il più sereno eppure spettacolare luogo di esserla sarebbe difficile descrivere quanto confortevole siamo stati veramente per i 15 giorni che abbiamo occupato questa casa ancestrale. Foto alberi di ulivo vecchi di 300 anni e statue che risalgono 150 anni las nostra famiglia torneremo in questa casa ogni volte che visiteremo Sicilia, sopratutto a causa dell'amore e la cura della famiglia e il personale di questa incredibile tenuta! Senti nessun ulteriore...questo rimane di proprietà! PS ~ E non caricare la posizione del giro in auto ad esso vi farà sentire stupido, come ho fatto io!!! Have you ever wondered what it would be like to discover family half-way around the world? !...It's AWESOME!!! There are family meals...and dancing, and family meals, and selfies, and family meals, and little princesses...well, you get the picture...LOTS of family meals!!! More importantly, if you are born into a Sicilian family like mine...you are TRULY blessed! This home was the most amazing scene for a 50-something woman to discover the family she'd never met before. The home was the most serene, YET spectacular place to be. It would be hard to describe just how comfortable we really were for the 15 days we occupied this ancestral home. Picture 300 year old olive trees, and statues that date back 150 years. Our family will stay in this home each and every time we visit Sicily...most ESPECIALLY because of the love and care of the family and staff of this amazing estate! Look NO further, this property will amaze you! PS ~ don't judge the location by the car ride up to it, you will feel foolish, like I did!!! We had an amazing week at Villa Consiglio. The view are amazing, overlooking the sea and the mountains, the house are beautiful with Classic Italian woodtables and the garden are perfekt with gorgeous palmtrees, cactuses and flowers between Roman statues. We had our breakfast out on the huge terrasse and early nigits we had dinner with the great view overlooking the sea. Late dinners we were sitting in the valv overlooking the uplightned pool. We had the best welcome from Pietro and Rosella with supplies stucket in the kitchen and they also made us some antipasto for us to eat when we arriverat late. Perfekt! We also had Pietro and Rosella to come over to cook great Sicilien food one night. Great antipasto with frutte de mare, 2 gorgeous pastadishes and ofcourse some local Dolce. It was amazing! We spent lots of time in the garden by the pool, Reading books, looking at the kids having fun playing. Relaxing! We recomend this place highly! Linda hai una famiglia splendida compreso i tuoi amici, siamo onorati di avervi conosciuto, spero un giorno di rincontrarvi PIETRO e ROSSELLA. the best accommodation we had in Italy - and the very best owners. They were so nice and friendly and made everything very comfortable. The house is big and modern and clean with the nice pool area. we loved the vacations there! and Pietro and Rosella! GRAZIE !!!!! abbiamo avuto la fortuna di incontrarvi siete splendide.